Global real estate investment manager, Cromwell Property Group has finalised the sale of Bundall Corporate Centre to CorVal Partners for $89 million. The sale of the site followed the lodgement of a planning application with Gold Coast Council in February for a $1 billion multi-stage retail and residential masterplan. Cromwell CEO Paul Weightman said the successful sale capitalised on the strength of the Gold Coast market ahead of the 2018 Commonwealth Games. “The planning application has added significant value to the asset, attracting interest from both domestic and international buyers," he said. "The site is positioned well for the future and we are pleased to have secured such a highly-regarded buyer. "The site currently comprises two A-Grade office towers, a gym and 15,500 square metres of surrounding land. The proposal for the high-profile corner of Bundall Road and Slatyer Avenue – including three residential towers, a shopping centre and dining precinct – is set to contribute to the city’s broader revitalisation. “Cromwell is known for our consistent ability to invest wisely and reposition assets for profit. We continuously review our asset strategies to provide optimal returns for our investors, and the Bundall Corporate Centre is just another example of our value-add capabilities at work,” Mr Weightman said. McVay Real Estate managed expressions of interest and finalised the transaction on behalf of Cromwell. 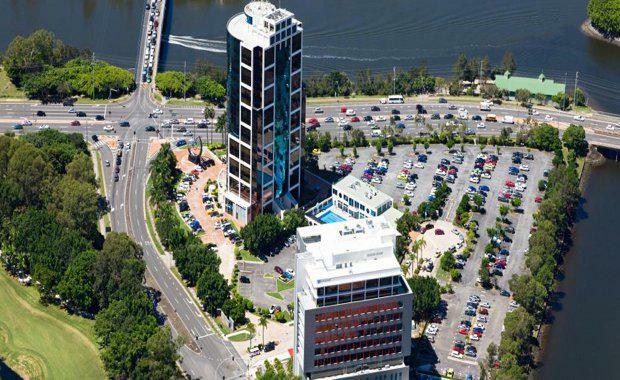 Cromwell already has a history with the Bundall Corporate Centre Complex, having initially purchased the one-tower site in 2005 for $52.8 million and sold it in 2007 for $106 million. The site’s second tower, the Wyndham Corporate Centre, was completed in 2009 and Cromwell reacquired the site in 2011 for approximately 60% of its 2007 sale price.